Gennady Dmitrievich Karpenko. Doctor of Science, correspondent member of the National Academy of Sciences of Belarus, member of the Eurasia International Academy of Sciences, honored scientist of the Republic of Belarus, Science and Engineering State Prize winner. Mr. Karpenko patented 50 inventions; his award winning scientific designs are implemented in 15 countries. Gennadyi Karpenko was born on September 17, 1949 in Minsk. Obtained a degree from Belarusian Polytechnic Institute. From 1983 worked in the scientific production industry in the area of powder metallurgy research and development. Came into politics in the late 80s. Was elected deputy in 1990 and a member of Presidium of the Supreme Soviet of the 12th Convocation. 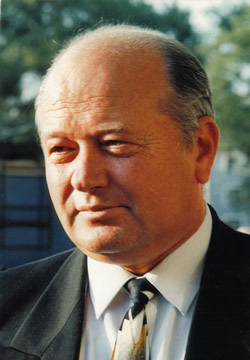 From 1991 to 1994 held the post of mayor of the city of Molodechno. From 1994 to 1999 deputy chairman of the Supreme Soviet of the 13th Convocation, deputy chairman of the United Civic Party, head of the opposition National Executive Committee Gennady Karpenko turns into one of the most influential political opponents of Lukashenko and an indisputable opposition leader capable of uniting Belarusian democratic forces. Mr. Karpenko's sudden death accompanied by a series of mysterious events happened only a month before the date of alternative presidential elections supporters of which refused to recognize imposed by Lukashenko changes to the Constitution that led to extending his term in office. Unquestionable favorite of those elections and one of the initiators of the Lukashenko’s impeachment procedure Gennady Karpenko posed a real threat for the ruling regime. Photographs of Gennady Karpenko selected by his family members.